The O.I.D.O.O database was developed as both a scholarly research tool and a means for the publication of the unpublished Oriental Institute Demotic ostraca. It is our aim to make available all of the Demotic ostraca in this collection, both published and unpublished, to scholars worldwide in a format that will allow for complex searching and sorting criteria as well as quick and easy updating. This will be accomplished through periodic updates as additional texts are edited and entered into the database. Click here to access the Oriental Institute Demotic Ostraca Online (O.I.D.O.O.). On the following page, select "guest" and click "login." In order to view the Demotic transliteration fonts correctly, download the O.I.D.O.O. Font and place it in the fonts folder on your computer. The editorial leadership of the Ancient Near East Monograph Series / Monografias sobre el Antiguo Cercano Oriente, an open-access, online (with print on demand) monograph series, is transitioning. Ehud ben Zvi (University of Alberta) and Roxana Flammini (Universidad Católica Argentina) are handing over editorial oversight to Alan Lenzi (University of the Pacific) and Juan Manuel Tebes (Universidad Católica Argentina, Universidad de Buenos Aires). The focus of the ANEM/MACO series is on the ancient Near East broadly construed from the early Neolithic to the Hellenistic eras. Studies that are heavily philological or archaeological are both suited to this series and can take full advantage of the hypertext capabilities of "born digital" publication. Monographs as well as multiple author and edited volumes are accepted. Proposals and manuscripts may be submitted in either English or Spanish. Manuscript proposals are peer reviewed by at least two scholars in the relevant area before acceptance. Publication of the finished manuscript is contingent on a second round of peer review. Monographs that are entirely Assyriological, Hittitological, or Egyptological are as appropriate to this series as are monographs in North West Semitics or Biblical Studies. Given the open-access availability of published monographs (in PDF), publishing your work in this series guarantees its availability to scholars around the world, even to those with minimal economic resources. Requirements for a proposal are available here. For published volumes in the series and the full editorial board, see here. I look forward to hearing from interested scholars. Archaeological Reconnaissance of Uninvestigated Remains of Agriculture (AROURA) is an archaeological geophysics and surface survey of the plain around the 13th century BCE fortress of Glas, Boiotia, central mainland Greece, beginning in October 2010 and lasting until November 2012. It aims to detail the Mycenaean hydraulic, drainage, and land-improvement works around the fortress, and to search for traces of the expected extensive agricultural system they served. AROURA is an official collaboration between the University of Maryland, Baltimore County (UMBC), and the 9th Ephorate of Prehistoric and Classical Antiquities (IX EPCA) of the Hellenic Ministry of Culture and Sports, based in Thebes, Dr. M.F. Lane (UMBC) and Dr. A. Charami (IX EPCA) co-directors. Note: The caption for Figure 13 has been revised (Dec. 2012) to indicate both LH IIIA2 and LH IIIC wares represented. AROURA 2010 Preliminary Report Note: Upon further analysis, the band of silty soil mentioned on p. 21 is now thought to represent an area of land more often above water than the surrounding territory, after the reflooding of the Mycenaean polder (August 2011). Version 1.0 (January 2015), Leuven 2015, ix & 357 pp. (2.3 Mb). Leuven 2014 [= Diss. Leuven 2007], xiii & 578 pp. (28.4 Mb). This series, edited by W. Clarysse (K.U.Leuven), M. Depauw (K.U.Leuven), and formerly also the late H.J. Thissen (Universität zu Köln), aims to provide freely downloadable pdf-documents with scholarly tools based upon or providing links to the Trismegistos database. Contributors can send in manuscripts in Word format to mark.depauw@arts.kuleuven.be. The editors will decide whether the manuscript fits in the series and can be accepted for reviewing. An anonymous version of the manuscript will then be sent to two or more peers for evaluation. On the basis of their report the editors will take a decision whether to publish it in the series or not. Authors will be given the anonymous notes of the reviewers and can be asked to implement changes to their manuscript. This companion volume to the exhibit of the same name examines the multicultural city of Fustat, capital of medieval Egypt and predecessor to modern Cairo. It explores the interactions of Muslim, Christian, and Jewish communities within urban city life. These three communities practiced their own beliefs and enacted communal self-government, but they also intermingled on a daily basis and practiced shared traditions of life. Essays by leading scholars examine the different religions and languages found at Fustat, as well as cultural aspects of daily life such as food, industry, and education. The lavishly illustrated catalog presents a new analysis of the Oriental Institute’s collection of artifacts and textual materials from 7th through 12th-century Egypt. Highlights include documents from the Cairo Genizah (a document repository) of the Ben Ezra Synagogue as well as never-before-published artifacts from archaeological excavations conducted at Fustat by George Scanlon on behalf of the American Research Center in Egypt. The volume encourages discussion on the challenges of understanding religion through objects of daily life. Felix Albrecht; Per Ambrosiani; Tara Andrews; Patrick Andrist; Ewa Balicka-Witakowska; Alessandro Bausi; Malachi Beit-Arié; Daniele Bianconi; André Binggeli; Pier Giorgio Borbone; Claire Bosc-Tiessé; Françoise Briquel-Chatonnet; Paola Buzi; Valentina Calzolari; Alberto Cantera; Laurent Capron; Ralph M. Cleminson; Marie Cornu; Marie Cronier; Lorenzo Cuppi; Javier del Barco; Johannes den Heijer; François Déroche; Alain Desreumaux; Arianna D'Ottone; Desmond Durkin-Meisterernst; Stephen Emmel; Edna Engel; Zuzana Gažáková; Antonia Giannouli; Jost Gippert; Alessandro Gori; Oliver Hahn; Paul Hepworth; Stéphane Ipert; Grigory Kessel; Dickran Kouymjian; Paolo La Spisa; Isabelle de Lamberterie; Hugo Lundhaug; Caroline Macé; Marilena Maniaci; Michael Marx; Alessandro Mengozzi; Manfred Mayer; Joseph Moukarzel; Sébastien Moureau; Mauro Nobili; Renate Nöller; Denis Nosnitsin; Maria-Teresa Ortega Monasterio; Bernard Outtier; Laura E. Parodi; Tamara Pataridze; Irmeli Perho; Delio Vania Proverbio; Ira Rabin; Arietta Revithi; Valentina Sagaria Rossi; Nikolas Sarris; Karin Scheper; Andrea Schmidt; Denis Searby; Lara Sels; David Sklare; Wido van Peursen; Annie Vernay-Nouri; François Vinourd; Sever J. Voicu; Witold Witakowski; Jan Just Witkam; Ugo Zanetti. The volume is the main achievement of the Research Networking Programme ‘Comparative Oriental Manuscript Studies’, funded by the European Science Foundation in the years 2009–2014. It is the first attempt to introduce a wide audience to the entirety of the manuscript cultures of the Mediterranean East. The chapters reflect the state of the art in such fields as codicology, palaeography, textual criticism and text editing, cataloguing, and manuscript conservation as applied to a wide array of language traditions including Arabic, Armenian, Avestan, Caucasian Albanian, Christian Palestinian Aramaic, Coptic, Ethiopic, Georgian, Greek, Hebrew, Persian, Slavonic, Syriac, and Turkish. Seventy-seven scholars from twenty-one countries joined their efforts to produce the handbook. The resulting reference work can be recommended both to scholars and students of classical and oriental studies and to all those involved in manuscript research, digital humanities, and preservation of cultural heritage. The volume includes maps, illustrations, indexes, and an extensive bibliography. Les États généraux de l'Antiquité : quels enjeux pour demain? En 1924, au lendemain du premier conflit mondial, Paul Valéry se demandait déjà si l’Europe allait conserver sa prééminence mondiale dans tous les domaines ou si elle n’occuperait pas plutôt la place que la géographie lui assigne : « un petit cap du continent asiatique ». Revenant à l’Antiquité, il considérait « comme européens tous les peuples qui ont subi au cours de l’histoire les trois influences » que sont Rome, le christianisme et la Grèce. Aujourd’hui, en 2015, nous savons que le temps tisse les civilisations dans un perpétuel mouvement et qu’elles se nourrissent les unes des autres. Ce mouvement de renouveau existe dans la mesure où le présent et l’avenir se nourrissent du passé. C’est pourquoi l’Antiquité proche-orientale, grecque et romaine est non seulement aux origines mais aussi au cœur de notre civilisation européenne, comme un terreau fertile, ce que nous voulons affirmer haut et fort dans une expression commune des historiens, des linguistes, des archéologues, des juristes et des spécialistes de la pensée et des littératures anciennes. Ces enjeux seront débattus au cours de trois tables rondes : sur l'Antiquité et l'éducation, sur l'Antiquité et la culture européenne au XXIe siècle et sur l'Antiquité et la recherche. The Czech Institute of Egyptology has organized an international conference Profane landscapes, sacred spaces, which took place on 26th and 27th June 2014 at Faculty of Arts, Charles University in Prague. The aim of the meeting was a discussion of the issues connected to environment development and climate change research in Egyptology, and to the ways ancient Egyptians reflected their environment and created sacred spaces within the natural landscape. Hana Navrátilová: Visitors’ graffiti - traces of a re-appropriation of sacred spaces? John Gordon Lorimer’s monumental Gazetteer of the Persian Gulf, Oman and Central Arabia – often simply referred to as ‘Lorimer’ by many researchers - has been digitised and is now accessible for free through the Qatar Digital Library. Part III (IOR/L/PS/20/C91/3) consists of twenty-one genealogical tables for the ruling families of the Persian Gulf, Oman and Central Arabia. The Gazetteer’s second volume (IOR/L/PS/20/C91/4) is the ‘Geographical and Statistical’ section and includes alphabetical entries for tribes, towns and regions, from ‘Abdalilah to Zubārah. It also contains fifty-six reproductions of photographs taken by British colonial officers, but also German explorer, Hermann Burchardt, and Raja Deen Dayal and Sons, official photographers to the Viceroy of India. The Gazetteer includes two maps: a chart of pearl banks on the Arabian littoral of the Persian Gulf included with the genealogical tables; and a large ‘Map of the Persian Gulf, ’Omān and Central Arabia’ (IOR/L/PS/20/C91/6) produced by Lieutenant Frederick Fraser Hunter in consultation with Lorimer. And see also Colonial Knowledge: Lorimer’s Gazetteer of the Persian Gulf, Oman and Central Arabia, in the Untold Lives blog from the British Library. A series of seminars looking at a number of current major projects to apply digital techniques to the study of the ancient world. These seminars will be webcast using the Panopto software. To view the webcast, please click on the individual link provided under the date of each seminar. The link will go live at 17.05 GMT in each case. When viewing the webcast in your browser, you will see both speaker and the speaker's slides together by default, but you can switch either speaker or slides to full screen. The software works best with Firefox, Safari, and Chrome. What is TEI? And Why Should I Care? All talks start at 5pm, and are followed by discussion and drinks. If you wish to dine with the speaker afterwards, at a local restaurant, please contact the convenor : jonathan.prag @ merton.ox.ac.uk. Updated: KIRKE: Katalog der Internetressourcen für die Alte Geschichte, Byzantinistik, Klassische Philologie, Mittel- und Neulateinische Philologie sowie Vor- und Frühgeschichte. Der Fachinformationsführer zu Internetressourcen wurde technisch und optisch erneuert. Das Fachportal Propylaeum arbeitet ständig an einer Verbesserung und Weiterentwicklung seiner Angebote. Zu diesen Angeboten zählt auch der Fachinformationsführer zu altertumswissenschaftlichen Internetressourcen (Websites, Forschungsprojekte, etc.) KIRKE, der nun technisch und optisch überarbeitet wurde, um eine noch bequemere Recherche in qualitätsgeprüften Internetressourcen zu ermöglichen. Die bisher eingesetzte Suchmaschinentechnologie wurde aktualisiert und mit einer neuen Präsentationsoberfläche versehen. Dies ermöglicht dem Nutzer, sich noch einfacher zu orientieren. Bereits mit dem Start des Rechercheinstruments werden (wie bisher) alle vorhandenen Treffer angezeigt (sog. „Zero-Term-Search“), die man dann mit Hilfe von fachlichen und formalen Kriterien filtert. Neu ist u.a. eine Literaturlistenfunktion, mit deren Unterstützung Titel selektiert und exportiert werden können. Natürlich gibt es auch weiterhin die allgemeinen Recherchefunktionen (einfache Suche / erweiterte Suche). Dem Relaunch ging nicht zuletzt eine Usability-Studie voraus, deren Ergebnisse in den Entwicklungsprozess mit eingeflossen sind. A cura della Facoltà degli Studi per l'Oriente Antico del Pontificio Istituto Biblico. BLACKMAN, A.M. - OTTO, E. - VANDIER, J. - de BUCK. The Building Inscription of the Berlin Leather Roll Studia Aegyptiaca I Analecta Orientalia 17 Rome Pontificio Instituto Biblico 1938.. It's big (11,261 texts spanning two millennia, containing 1.38 billion tokens in total). The metadata for these volumes contains not just the date of publication for a specific edition of a work, but a window for the date of composition as well (as determined by undergraduate students in Classics; see JCDL 2011 for more details), which enables historical analysis that the date of publication can't. The metadata may have a few errors and style differences between the different annotators, but I'm putting it up on Github for version control if anyone spots mistakes and wants to correct them. Der Edfu Explorer Online ist eine Datenbankplattform, die das Edfu-Projekt der Akadamie der Wissenschaften zu Göttingen zur Verfügung stellt. Er beinhaltet das Formular der Texte des Tempels von Edfu, soweit es durch die Publikationen 'Die Inschriften des Tempels von Edfu' bereits freigegeben wurde. Zur Zeit betrifft dies die Übersetzungen der Chassinat-Bände Edfou VII und VIII. Des weiteren hat der Nutzer Zugriff auf die mit den jeweiligen Datensätzen verbundenen Fotos des Edfu-Archives, sowie die betreffende Seite der Chassinat-Publikation. Für Formularstudien steht ein zweidimensionaler Plan des Tempels zur Verfügung, der den Zugriff auf die Chassinat-Seite über die Szenenposition ermöglicht. Innerhalb des Tempelplans wird der Szenentitel automatisch eingeblendet, sobald die Maus länger als eine Sekunde über dem Szenenfeld gehalten wird. The Center for Hellenic Studies is pleased to announce the online publication of Amphoteroglossia: A Poetics of the Twelfth-Century Medieval Greek Novel, by Panagiotis Roilos on the CHS website. This work offers the first systematic and interdisciplinary study of the poetics of the twelfth-century medieval Greek novel. This book investigates the complex ways in which rhetorical theory and practice constructed the overarching cultural aesthetics that conditioned the production and reception of the genre of the novel in twelfth-century Byzantine society. 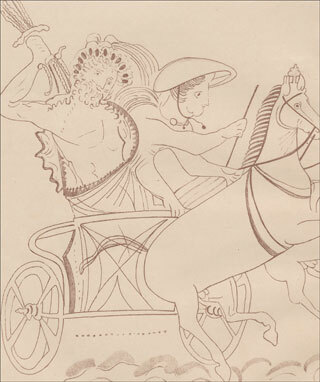 By examining the indigenous rhetorical concept of amphoteroglossia, this book probes unexplored aspects of the re-inscription of inherited allegorical, comic, and rhetorical modes in the Komnenian novels, and offers new methodological directions for the study of Byzantine secular literature in its cultural complexities. The creative re-appropriation of the established generic conventions of the ancient Greek novel by the medieval Greek novelists, it is argued in this wide-ranging study, has invested these works with a dynamic dialogism. In this book, Roilos shows that this interdiscursivity functions on two pivotal axes: on the paradigmatic axis of previously sanctioned ancient Greek and–less evidently but equally significantly–Christian literature, and on the syntagmatic axis of allusions to the broader twelfth-century Byzantine cultural context. A printed copy of the book is available through Harvard University Press. Panagiotis Roilos is George Seferis Professor of Modern Greek Studies and Professor of Comparative Literature at Harvard University. What Do You Do with a Million Links? AWOL: Now We are Six!